Hey you! Yes YOU…newbie entrepreneur! If you are reading this blog post then you are most likely trying to figure out how you can “not look like a newbie” even though you’re just getting starting with your business or blog. Well just because you are new to the game of entrepreneurship, it doesn’t mean you have to look new! Let me explain. When you are a new business owner, the last thing you want to do is run people off. You need all of the blog readers, viewers, subscribers and customers you can get. One of the biggest mistakes newbie entrepreneurs make is acting as if, they are well…NEW. Now, I’m not saying you have to fake it til you make it (we’ll talk about that more in a second), but you do want to present and position yourself as someone of value, who knows what they are doing and will be taken seriously. People buy from companies, businesses, and brands that they trust and if you for one second don’t look like you are up to par, you could be putting your reputation and your business at risk. So to help you avoid the newbie tag, and set yourself up to survive the initial stages of entrepreneurship, are 5 tips to help you show up online as if you’ve been doing this forever! As an entrepreneur, it’s important to recognize what you are able to offer that is better, or at least different, from others. And to differentiate yourself from every other “newbie” online, you must learn how to exploit your strengths and leverage what makes you unique in order to stand out. Take note of the things you are “exceptionally good at” and use those things to create separation between you and the competition. What do you know you are good at? (Write down all your strengths, gifts, talents, and attributes. What do other people tell you you’re good at? You get a positive response when you are doing…what? What type of experience can you give your audience that is unique to only you? Why would someone hire you? What’s the benefit? How do you want people to feel after they have read a blog post, purchased a product or worked with you? When you acknowledge what truly sets you apart, you can focus more on doing the things that will shine a light your uniqueness – helping you build a stronger business, faster! Need help figuring out what it really takes to build a stand out brand? Download the Fix My Brand Checklist HERE to go from I’m-not-sure-what-I’m-doing rookie to show-me-the-money influencer! If you were blogging for just one person, who would the ONE person be? Sometimes when you’re starting out, it can be tempting to declare your biz is for everyone! Knowing who you serve, what they want and how you can help them is so important. You don’t want your perfect fit fan to land on your blog or your social media sites and be confused about what you are all about, right? You want them to know within seconds that you, your blog, your biz is the right biz for them. When you know EXACTLY who you serve, you’re giving yourself the best possible chance to connect, communicate and capture your perfect fit community. Is your perfect fit fan male, female? What’s their biggest challenge, their goals, desires, needs, wants? Do they have free time and if so what do they do with that time? So you may be thinking, “why not cast the net wide and catch as many customers as I can? When you try to cater to too many different types of people or create too many different products, it’s harder for your audience to grasp on to all of them. Having a focus means that “your perfect fit fan” will find your blog or business and feel like “this is the place for me!” Which means more sales for you. You want to connect with people that you are uniquely equipped to help. McDonald’s can’t do anything for a vegan. You can’t say that you’re an expert at any one thing if you’re not connecting your products with the right people. When you don’t know who you want to serve, you set yourself up for failure by giving yourself the task of marketing a business that isn’t clear on what it really represents or by having the enormous task of marketing to too many different groups of people. In other words, when it comes to business, don’t be a jack of all trades! So, stay focused on what you do best, serve those who need what you have and be consistent in connecting with them. When you are a new entrepreneur, you need all the help you can get. And you will quickly come to realize that you can’t do it all. I mean really, who wants to spend all their time writing html code for their blog? But help doesn’t simply fall out of the sky. You have to ask for it. The simplest, fastest and best way to get out of the “newbie” zone is to associate yourself with other successful people. Birds of a feather flock together and if you want to be seen as someone of value, you gotta hang out, build relationships with and be seen associating with other successful people. It’s the guilty-by-association effect. Yeah, you may have started your online business or blog so you wouldn’t have to deal with other people (it’s okay, I’m an introvert too!) but if you really want to learn, and grow and be seen as an expert, it will be important for you to find others that can inspire you, give you ideas, share their resources, and help you grow. It’s important to surround yourself with people (even it’s it virtually) who are already doing and accomplishing the things you want to do in your business. When I first started online I had no clue what I was doing. I was stubborn and I thought I could do everything myself. Well, that got old real quick and I knew that if I was going to succeed, I was going to have to get out and network. So that’s what I did. I worked the net! I found a mentor. I joined and engaged in Facebook groups. I connected with other influencers on social media. I attended both online and offline events. And as a result, something amazing happened. New opportunities started to come up, collaborations were created and because I was sharing tons of value, people began sharing my blog posts, commenting on my profiles and recommending my products. 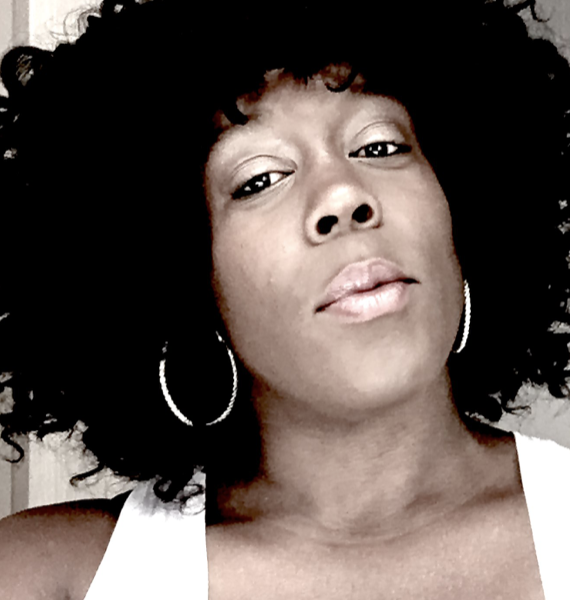 I cannot tell you how many great things have happened because I made a conscious decision to put myself out there. You might be one relationship away from the best day of your life! Don’t be afraid to talk to people or ask for help. You’ll be surprised by just how far people will go to help you. Your job is to remove any resistance your audience may have when it comes to working with you. That means generating great content, helping them solve their problems, and providing a one of a kind experience that they can’t get anywhere else. If you lead with “newbie over here” then it just gives people an excuse to go with, buy from, or partner with someone else. Have you ever heard someone say, well you don’t know what you don’t know? Well, your audience doesn’t know what you don’t know either! When it comes to building your business you want to do everything possible to show your audience that you have what it takes to satisfy their need to solve their problem, but do not pretend to know what you don’t know. When you pretend to be someone you’re not, or pretend to know things that you really don’t know, just because you think that is what your audience wants, you are doing yourself and your audience a disservice. Plus, people are smarter than you think. They can sniff out a fraud. So don’t do anything (or be anyone) that could jeopardize the trust you want to establish with your community. Give yourself the chance to learn, to grow, to evolve organically. If you are truly passionate about growing your business, it will be just a matter of time before you really become that person you always dreamed of. It’s always best to be authentic, transparent and real. Understand that being an entrepreneur is not about being perfect, it’s about being YOU. 100% You! Build a brand that looks professional, pretty and profitable. 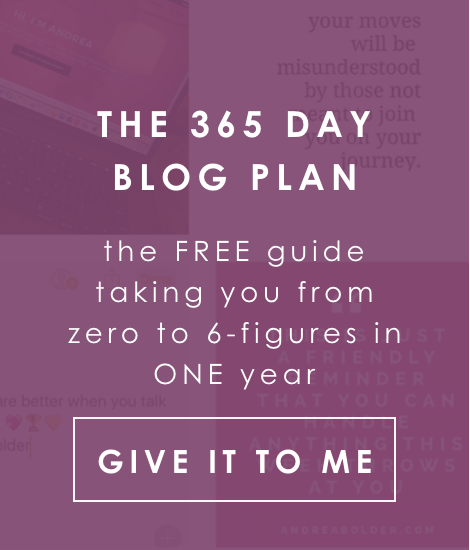 Create a blog that shares massive value, all the time! Respond positively to all comments, feedback, and suggestions. Remember that you have to be an active participant in your success and it starts with growing an engaged community. At the end of the day, you already have the secret sauce. Now it’s about using your superhero skills in a way that makes a strong positive impression on those you want to serve. 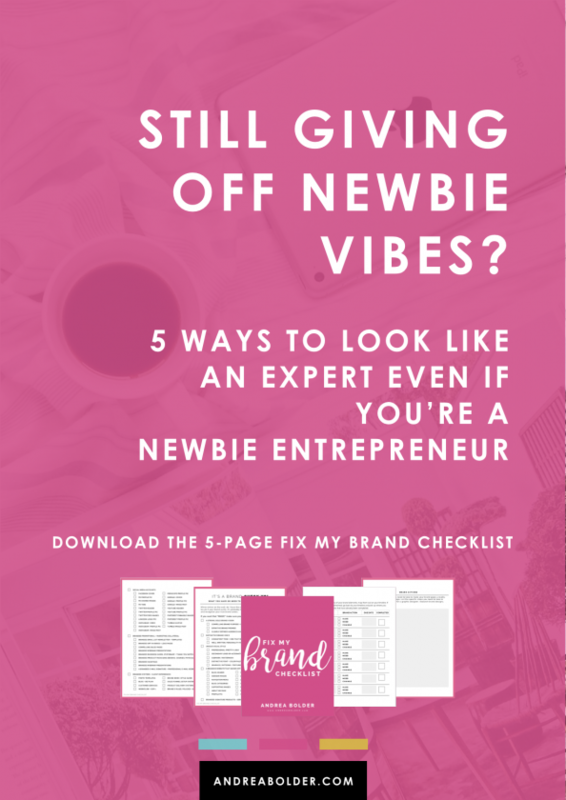 If you’re ready to wash off the “newbie” vibe, and start showing up like a pro online, make sure to download the Fix Your Brand Checklist now! Hi Andrea! You’re on point on that last tip. Many think ‘fake till you make it’ attitude is what will get them to where they want. However, they get lost in their own imagination and start to believe their own lie. The truth is, they know nothing and they just can’t admit it anymore. I believe that it is more profitable to know your weaknesses and work on them constantly. No one is expecting you to know everything about anything, and there is no shame in admitting ignorance about a certain subject. Personally, when I’m asked a certain question that I don’t know the answer to, I simply refer them to someone who has extensive knowledge about it and then I go do my own research. That way, we both learn new things every day. Thanks again for this great article!